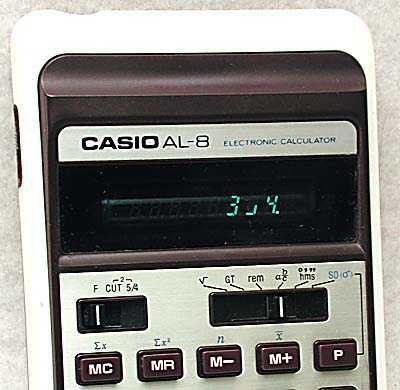 The Casio AL-8 and Casio AL-10 were the first hand-held calculators to accept and display fractions, and can also operate on and display in hours, minutes, and seconds. 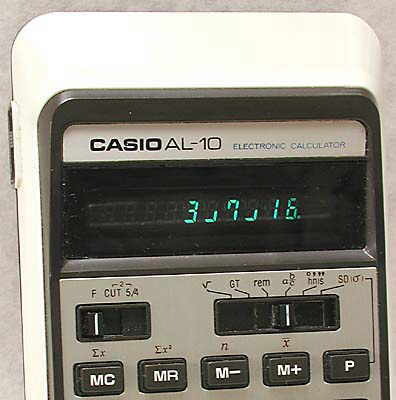 The Casio AL-8S can operate on and display fractions and also dates of the year. Distinctive features: Accepts and displays fractions and time. 4-function, %, memory, square root, fractions, hours minutes seconds, and Standard Deviation. 80 x 138 x 23 mm (3.1" x 5.4" x 0.9"). 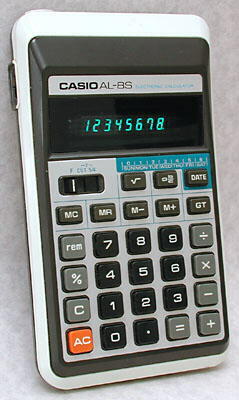 Price in the U.S.A. in august 1976 US$24.95. 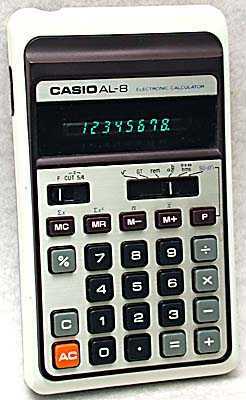 Note the slide switch on the right to select the mode, including fractions, hours minutes seconds, and standard deviation. Display is 10 digits, green fluorescent. 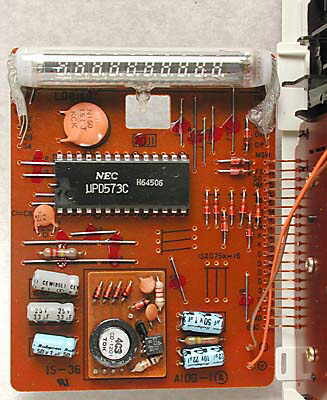 The circuit board of the Casio AL-10, showing the vacuum fluorescent display in a single tube, the chip made by NEC, and the voltage converter on a small board (to produce the driving voltage for the display). Distinctive features: Accepts and displays fractions, time, and dates. 4-function, %, memory, square root, fractions, date. 81 x 142 x 22 mm (3.2" x 5.6" x 0.9"). To add and subtract dates, and to find the day of the week of a date, the "DATE" button is used. In this case we wanted to find out the date and the day of the week 16 days after Christmas day 1978 (25th December 1978). 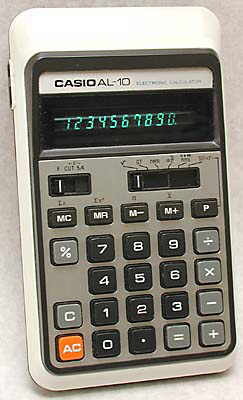 Enter 78 for the year, press "DATE", display shows 1978 (this calculator is not year 2000 compliant!). Enter 12 for the month, press "DATE", press 25 for the day, display shows 1978.12.25, as above. 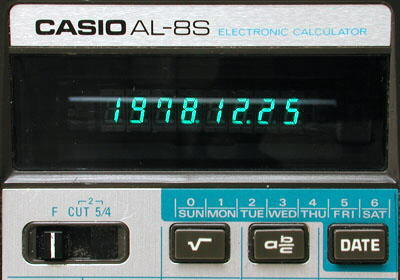 Press "DATE", display shows 78.12.25 - 1, as above, where the "- 1" indicates Monday. To find the date and the day of the week 16 days later enter "+" and "16", and the display show 79.01.10 - 3, as above, indicating that it will be 10th January 1979 and it will be a Wednesday. "Fraction action", Popular Science, August 1976 p73.